Millets are tasty grains. Trust me when I say this. The only reason why you might have had a lukewarm experience with millets is that our cooking procedures have tuned in so much with rice and wheat that we have forgotten how to cook millets well. 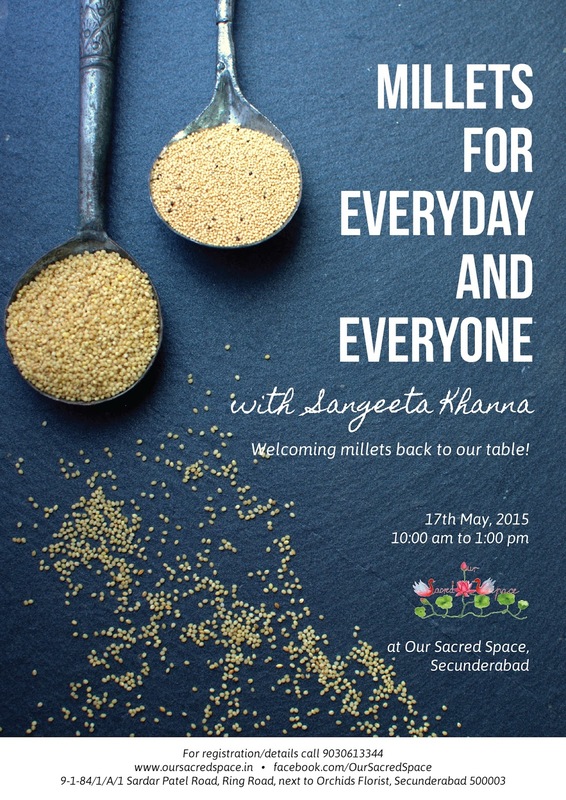 And no, there is nothing elaborate about cooking millets, it is actually simpler. We often make the recipes so complicated and overburden the ingredients with seasonings that the dish gets killed. 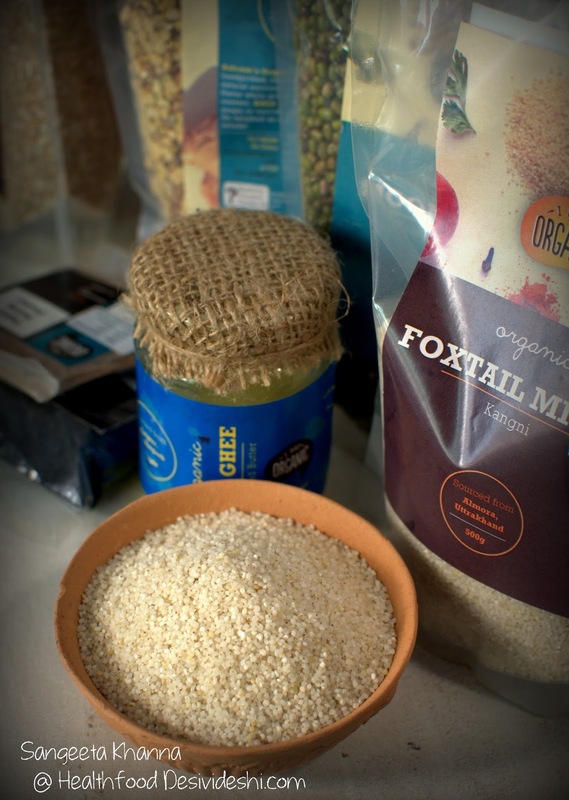 Millets need simpler treatment, simpler seasoning and fewer accompaniments in my experience. I am sharing the recipe of a very simple millet pongal made with Foxtail millet (kangni) and Mung daal (skinned yellow mung). Pongal is a savoury porridge that is a popular breakfast dish in the south but rarely made with millets. Pongal is also a popular temple prasad and I have had the best pongals of my life as prasad (offerings made to God and then distributed to everyone). I made this pongal for the participants of the workshop I conducted at Our Sacred Space in Hyderabad, with a theme 'Millets for everyone, for everyday'. The objective was to introduce the participants about how and why millets are better than wheat and rice for our own health as well as for the health of the planet and agriculture practices. The bunch of participants was a joy to interact with. I wanted something tangible for the participants at the end of the workshop so they could get a taste of what we talk about. I had made some multi grain panjeeri, some ragi crackers, Jau ki ghaat and jowar banana pankeas and a millet pongal was planned as live cooking. 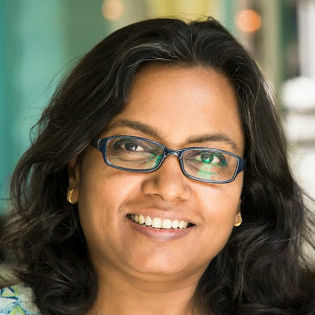 While I was confident about everything else, I felt really nervous about the pongal as this was one dish that I have not grown up eating and cooking it for people from Andhra was like a vegetarian talking about fish to a Bengali. Yes I was nervous for the pongal. This is a phone picture of the cooked pongal to which I added tadka in a huge pot. 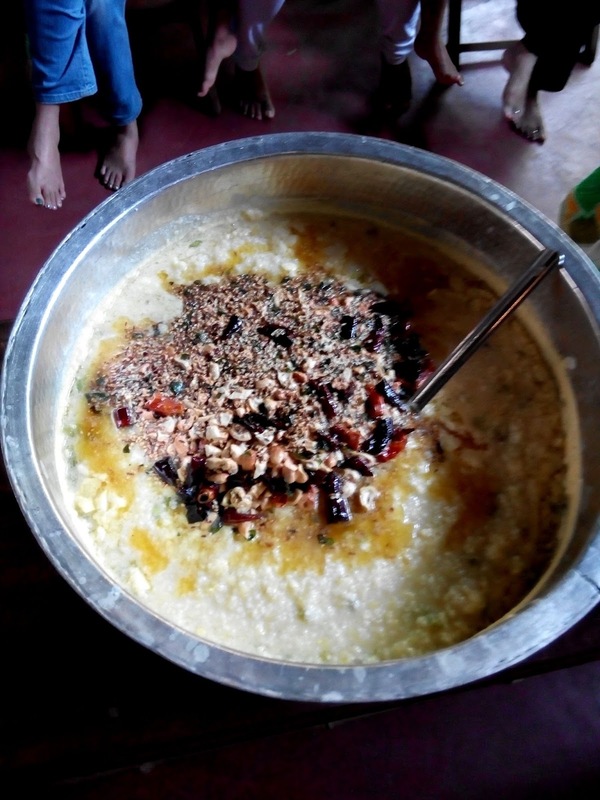 The pongal was made for 40-50 people. It was a pleasant surprise to know that everyone loved this pongal and took second and third helpings. The second thing everyone one loved was Jau ki ghaat because it was the right season for such a drink, although panjeeri, pancakes and crackers were all favourites. Panjeeri made an instant fan following there with people asking for more, saving some for themselves too. Pongal made me happy for obvious reasons. The feedback I got for this millet pongal was that they couldn't believe it could taste better than rice pongal. I was exhausted by the end of the workshop that lasted 4 hours but I did taste the pongal so I can recreate the same in my own kitchen later. But honestly speaking, when pongal is made in larger quantities the taste is better for some reason. 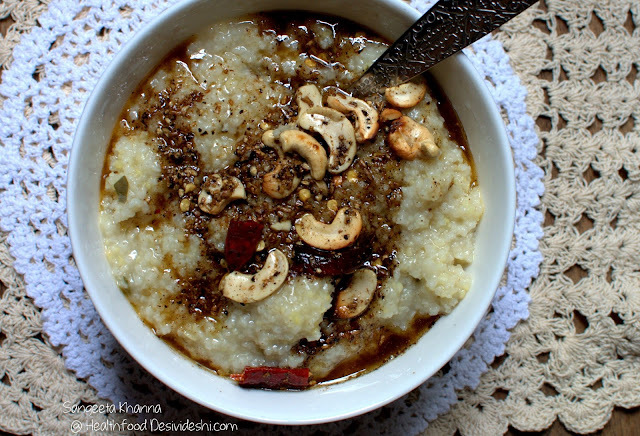 You might be familiar with the belief that prasad pongal always tastes better. Rinse the mung daal, drain and tip in to the cooking vessel. I used a large (12 Liter capacity) pot for cooking this pongal. Add the water and the salt and place it on stove. Let the mixture come to a boil, lower the heat and let it simmer for 20 minutes. Rinse the millet, drain water and tip in to the cooking pot. Let it come to a boil again and simmer for 30 minutes. You might need a little more water if the consistency is too thick. Add the chopped green chillies and 1/3rd of the ghee, mix well and let it simmer for a few more minutes. Now heat the ghee in a pan, add the asafoetida, cumin seeds, red chillies, pepper corns, curry patta and cashew nuts in that order and let them all get sizzling. Let the cashews get a bit brownish, the curry patta will also be fried nicely by this time. Add this whole mixture to the cooked pongal, mix well and keep the pongal covered. Serve while the pongal is still hot. This huge pot of pongal was hot for a couple of hours. Here is a picture collage of iphone pictures my friend Bhavana clicked. 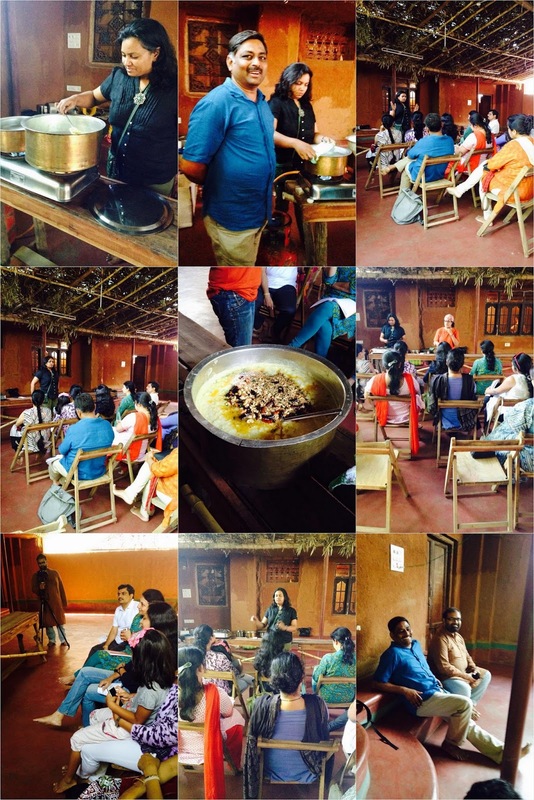 There were a few organic farmers at the workshop and some people who wanted to know more about millets and their uses. 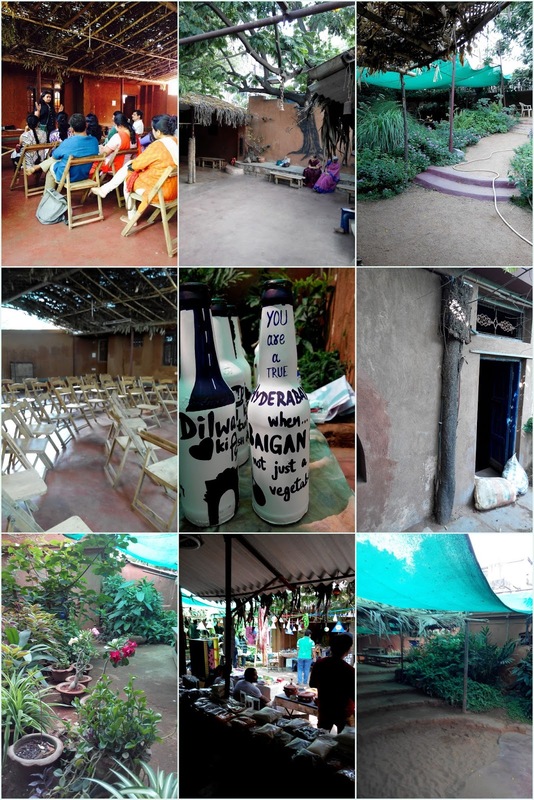 This workshop was organised and held at Our Sacred Space, brainchild of Nayantara Nandakumar who works tirelessly behind this beautiful space and its working. She has transformed her huge garden into a retreat, a mindfully done oasis of peace. Outdoors surrounded with beautiful plants, walls finished with mud and red oxide flooring gives this space a feel of an old village chaupal. Finding such a peaceful oasis in the heart of a crowded city Secuderabad feels like a bliss. Our sacred space holds farmer's markets to support local produce, flee markets for local craftsmen and workshops for children and adults on many different themes. The Sunday Farmer's market that I witness was so good I am dreaming if we could have something like that in Delhi. Later, back home I cooked the same pongal in pressure cooker. Since I was going to pressure cook the pongal in one step I decided to break the mung daal in smaller bits by running it into the mixie for a few seconds. The foxtail and mung mix was added to water (4 times the millet-lentil mix) and was pressure cooked with salt. Then a tempering was added and it made a really good lunch that day. I had chilled buttermilk with this meal. It has been just too hot in Delhi these days and we have lost our appetite for heavier foods. Watermelon, buttermilk, chilled mango slices, chilled milk etc is what I am having mostly but I do eat a few spicy meals in between too. This pongal made me so happy with it's spice quotient and still felt very light on the system. If you are using Pearl millet (bajra) or Barnyard millet (sama) for pongal you might like to cook them along with the mung daal as those take a bit longer time to cook. Just adjusting the cooking time and consistency you should be able to cook a delicious pongal with just any kind of millets you choose. I was so glad to see so many varieties of millets available in Hyderabad, specially Our Sacred Space Sunday market was treasure trove for organic food seekers. 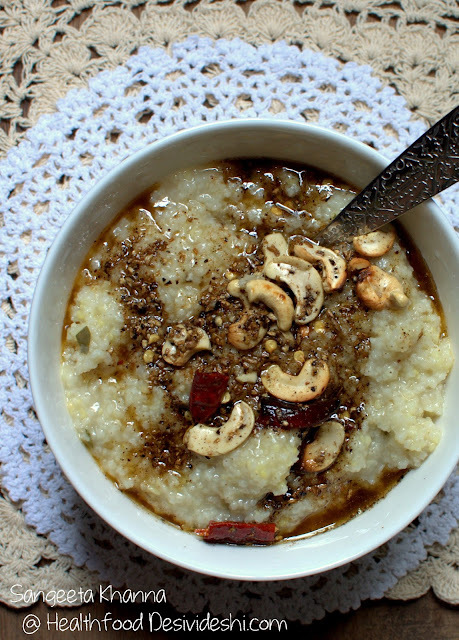 The variety of millet rawa (millet semolina), millet vermicelli, broken millets etc is so good you would want to find out more ways to cook with them. I buy my millets from Navdanya store, Down to Earth website and I Say Organic whenever possible. I also collect millets and lentils from my travels to interiors of the country. This foxtail millet from I Say Organic is from Uttarakhand. Do let me know whenever you have a query about millets. I will be glad to share whatever I know. Millets are ancient grains that need to be brought back to mainstream, not only for our own health but to break the pattern of monoculture of wheat and rice that is cause much harm to the agriculture and food chain both. Did you know millets are hardy crops that can grow well in arid regions and don't need much chemical fertilizers or pesticides because they are naturally disease resistant. Also because millets have not been aggressively bred for huge yield etc. most millets are native varieties. Millets can be grown organically well and most millets you get in the market are grown by organic means. Bring back millets on your dining table, every day. Super post! As always so informative and full of delicious ideas. Now waiting for you to hold a workshop here in Gurgaon. Thank you :-) Would love to do a workshop here too Natasha. Let me see if I can.